Posted on Sunday, April 1st, 2012 at 1:00 pm. It’s three months until the wedding, and Daisy’s Taiwanese parents are still shunning her sister’s hopelessly white fiancé. To escape the prenuptial drama, Daisy goes on the hunt for a mysterious take-out truck whose dishes are to die for. Literally. But when her family gets caught in a feud between a ghostly gothic chef and a fearsome Nordic wedding planner, Daisy must face her destiny and save more than just a wedding day. 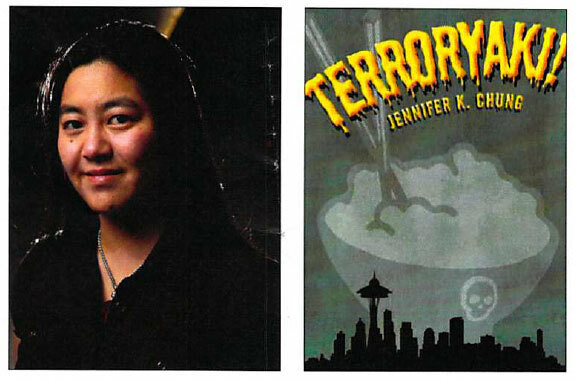 The winner of the 33rd Annual International 3-Day Novel Contest is a funny, spicy and creepy-sweet ode to food, family, love, Seattle, and the best—if slightly cursed—dish of chicken teriyaki to be found in this realm of existence. Look for this playful and appetizing first novel in finer bookstores, or order it today using the link above. Jennifer K. Chung is a Taiwanese-American software engineer, writer, pianist and older sister. She grew up in Southern California and studied computer science at MIT. In her spare time, Jennifer writes, plays keyboards in a goth metal band called Red Queen Theory and studies the Japanese martial art of Naginata. She lives near Seattle.